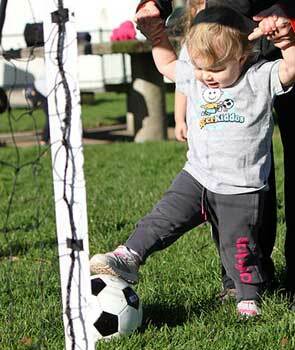 SoccerKiddos is a developmentally age appropriate program that introduces soccer to 18 month - 2 1/2 year olds in a fun, non-competitive, interactive manner. Classes are offered at various locations throughout Marin. SoccerKiddos views all children as capable learners and through Coach-Caregiver-Child partnership children will learn the basic skills of soccer while having fun! Children will not only gain the knowledge and love for soccer, but will also increase their gross motor, cooperation, and verbal skills while playing imaginary games incorporating soccer basics.